Nick Quarm Aggrotech, Harsh EBM Code : Red Core is the new persona of Ycarus Red Core (Gothic Guy), who has launched this project to reflect the Harsh EBM stereotype,starting a more aggressive, bitter sounding project. 'Fallen Angel' is a digital only, free EP released through Engraved Ritual, acting as a precursor to upcoming CD 'Over Our Toxins', due later this Spring. This promotional EP opens with 'Toxic Angel (Fallen Angel version)', a grimy, dark electro track, kicking off with a lengthy emergency siren, and breaking into uncharacteristicly slow, blisteringly heavy vocals. Ycarus' voice is very distorted, and almost incomprehensible, but the track itself is blinding, and is one of the most energetic and eerie tracks I've heard this year. The first remix on the album is one of two big surprises. Performed by 'Pipebomb' (Cosmo Morte of Scream Machine), it's almost disjointed , but the experimental little moments seem to seperate this track into thirds, and it's given a makeover that almost sounds like Cosmo's famous, downtuned Guitar work - It's the only time that a disjointed effect has worked in an artist's favour. 'Bleeding Corp'. also mix 'Desire', and it's nothing other than acceptable to me, remixes however only succeed or fail, I'm never on the fence with them. 'Toxic Angel' is mixed by 'Traumatize' - another act I've given a hard time to, but the two are really developing their Dark Electro, and I suspect their next release will invariably silence me again. The absolute pivotal moment on this album is the Witch House remix (you read that right), 'I Don't Care' is mixed by 'SKELETONKIDS' (Caps Intentional). Like typical Witch House in every sense, this could be White Ring without Kendra's cherub-like haunting vocal, Salem without the sense of urgency, and any other traditional drag band, without the array of symbols that this site won't accept. It's so sludgy and morose that it can almost depress, but it has that feel that Witch House can offer exclusively; but only when done with perfection. 'Graveyard Child Escape' and 'Cyber Croatian' also mix ' I Don't Care', and the Instrumental version of 'Toxic Angel' at the end is passable, but the other decent track on here is Detuned Destruction's remix of 'Electrous'. 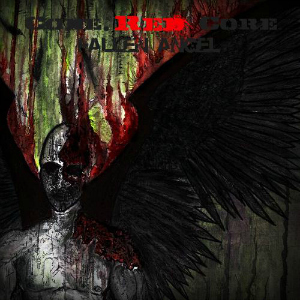 Code : Red Core is the new persona of Ycarus Red Core (Gothic Guy), who has launched this project to reflect the Harsh EBM stereotype,starting a more aggressive, bitter sounding project. With art crafted by Bind.Torture.Kill's 'Kreep', mastering by Tommy T, and a free license to download, there is no reason why any of you shouldn't get this release.